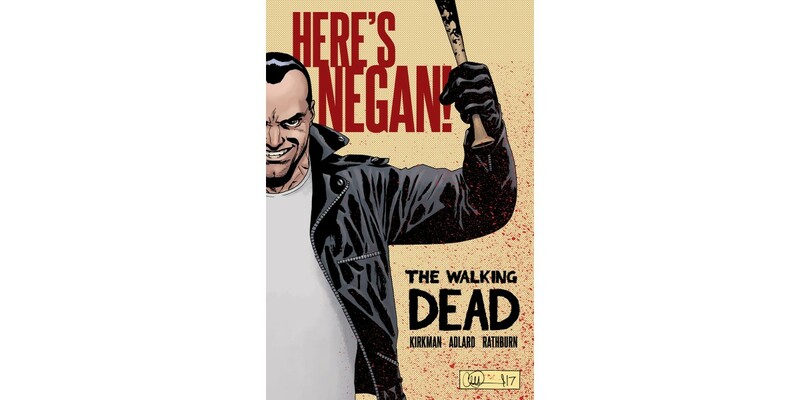 Bestselling, award-winning pop culture phenomenon Robert Kirkman (THE WALKING DEAD, OUTCAST BY KIRKMAN & AZACETA) and artist Charlie Adlard (THE WALKING DEAD) spin the backstory for one of the most controversial and complex characters in THE WALKING DEAD history in THE WALKING DEAD: HERE’S NEGAN! This special backstory was first serialized in Image+ magazine and will be collected in its entirety into a hardcover edition and made available through Image Comics/Skybound Entertainment this October. Who is Negan? Since his debut in THE WALKING DEAD #100, the charismatic psychopath has antagonized Rick Grimes, murdered his friend with a baseball bat wrapped in barb wire (which he calls "Lucille"), and led the Saviors into war against Alexandria and the neighboring communities.